On Wednesday, February 25th, American Samoa Community College (ASCC) administrators led a combined audience consisting of adjunct faculty and Teacher Education students through a workshop on the many facets of Assessment. In contrast to regular, full-time faculty, adjunct instructors typically come to ASCC from other local schools or government agencies, and may be employed part-time, or in some cases full-time as support staff under a 12-month contract. Unless they make a transition to full-time faculty, adjuncts do not have Career Service status with ASCC, although they may have it with another place of public sector employment. For several years now, ASCC has held Assessment trainings, workshops and seminars for its full-time faculty, and this most recent workshop offered adjuncts the opportunity to also get “in the loop” with regards to the College’s approach to evaluating both its students and degree programs. Leading the workshop were Dean of Academic Affairs Mrs. Letupu Moananu, Associate Dean of Academic Affairs Mrs. Evelyn Fruean, and Office of Institutional Effectiveness Director Mr. Sonny Leomiti. Students from Mr. Leomiti’s class Foundations of Curriculum and Instruction (ED 305) also took this opportunity to familiarize themselves with the basics of Assessment as a model for practice by working professionals. Associate Dean Fruean led off the proceedings with an overview of the Assessment model used by ASCC, explaining how Assessment incorporates clearly defined objectives and outcomes which can be used to measure success and facilitate continual improvement. She also offered a historical context for the Assessment model being commonly adapted today. Psychologist Dr. Benjamin Bloom, Mrs. Fruean said, might be considered the Father of Assessment for creating “Bloom’s Taxonomy” in 1956 in order to promote higher forms of thinking in education, such as having students analyze and evaluate concepts, processes, procedures, and principles, rather than having them just remember facts (rote learning). “Bloom’s Taxonomy is the document most often referred to by those who design educational, training, and learning processes,” Mrs. Fruean explained. Mr. Leomiti helmed the middle portion of the workshop, explaining how outcomes align to the overall progress of the institution. Leomiti emphasized to adjunct faculty the importance of understanding their role and purpose, and the importance of contributing to the outcome dialogue as an accountability measure to improve curriculum. “ASCC being an institution focused on student centeredness requires that we account for everyone who provide direct or indirect services to our ASCC students” concluded Leomiti. Dean Moananu used the final workshop segment to discuss how faculty themselves are assessed through instruments such as the Faculty Performance Evaluation. The Dean explained how each faculty member, whether full-time, part-time or adjunct, has a responsibility to the quality of his/her instruction, their students, their community, and to his/her own professional development, and how these responsibilities factor-in to the assessment of classroom performance at ASCC. 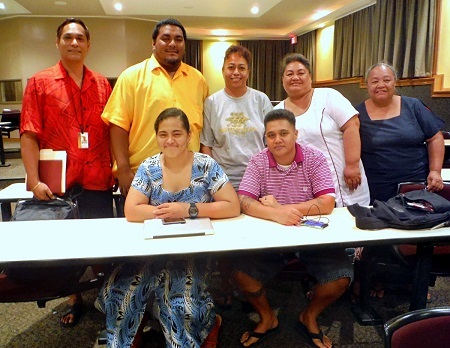 For more information on the American Samoa Community College, visit the ASCC web page at: www.amsamoa.edu.